Peter Paul Rubens (1577–1640), one of the greatest masters of the 17th century, painted this masterpiece as a young artist in Rome. Rubens depicted a moment of high drama in this popular Greek myth that was famously recounted in Ovid's Metamorphoses (c. 8 AD). Phaeton, the Sun-god Apollo's son, had begged and begged his father to allow him to drive the Chariot of the Sun across the sky. After Apollo finally conceded, his worst fears were confirmed: the rash youth had neither the strength nor the experience to control the chariot and keep it on its regular course through the heavens. The horses bolted in an erratic pattern, so that Earth either froze because the Sun Chariot was too far away, or it was scorched by the Sun's heat. At left, the Horae, butterfly-winged female figures personifying the seasons, which represent the harmony and order of the universe, are reacting in terror as Earth below bursts into flame. Even the great astrological bands that arch through the heavens are disrupted. Outside the picture frame, Jupiter, the supreme god, has just unleashed a thunderbolt aimed at Phaeton in order to save the universe from complete destruction. As the chariot disintegrates and the horses tumble apart, Phaeton plunges to his death. The story of Phaeton's hubris and subsequent destruction appealed to artists of the period not only for its drama character but also for its allegorical and moralizing implications. Generally, in 16th- and 17th-century publications of the Metamorphoses, the Phaeton legend was seen as a parable on the devastating consequences of pride and lack of moderation. In 1604, Dutch art theorist Karel van Mander interpreted Ovid's story as a recommendation "to keep the middle of the road/steering not too high nor too low." He also presented a political interpretation of the story, noting that the myth teaches us "how damaging it is that sometimes, when children or childlike rulers reign over countries, they cause not only their own ruin, but also that of their community." Such moralizing ideas may underlie Rubens's expressive scene, but his primary interest seems to have been to exploit the full pictorial possibilities of this cosmic drama. A number of pentimenti (changes of composition), visible to the naked eye, indicate that he worked on The Fall of Phaeton over a long period of time. 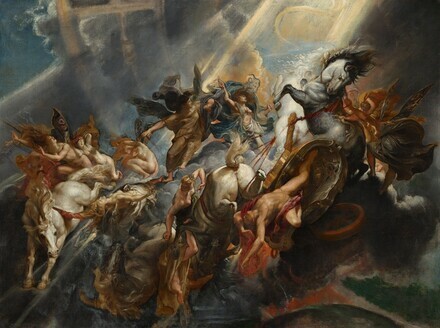 For example, Rubens painted over some of the horses' tangled straps and reins. Around 1600, Rubens, who had been trained in classical ideals and philosophy, travelled from Antwerp to Italy. In his travels to Venice, Mantua, Genoa, and Rome, he not only studied the cultural riches and artistic movements of antiquity and the great Renaissance masters –among them Tintoretto, Leonardo da Vinci, Raphael, and Michelangelo– but also absorbed the contemporary innovations introduced by artists such as Caravaggio. The inspiration he gained from this multifaceted exposure profoundly affected his own style of painting and became the foundation for his work. The dramatic light, powerful sense of movement, and complex poses in The Fall of Phaeton all exhibit Rubens's genius at assimilating that wide range of pictorial styles and visual motifs and his ability to infuse these with a new dynamism. Probably in the collection of Susanna Willemsens [d. 1657], Antwerp. (possibly General Gansell sale, Christie's, London, 25 February 1775, no. 81 [bought in for £67]). James Du Pre Alexander, 3th earl of Caledon [1812-1855], London, before 1857; by inheritance to his son, James Alexander, 4th earl of Caledon [1846-1898], London; by inheritance to his son, Eric James Desmond Alexander, 5th earl of Caledon [1885-1968], London; (his sale, Christie, Manson & Woods, London, 9 June 1939, no. 24, as by A.J. van Diepenbeck); Mrs. Sanderson, London; S. [Mrs. Gustave] Delbanco, London, by 1954; Gustave Delbanco, London; purchased 5 January 1990 through (Ellin Mitchell, New York) by NGA. Listed as "Eenen Phaeton van Rubens, op doeck" in the inventory of Willemsens collection made in Antwerp on July 6, 1657. See Jean Denucé, The Antwerp art-galleries; inventories of the art collections in Antwerp in the 16th and 17th centuries, Antwerp, 1932: 197. Algernon Graves, Art Sales from Early in the Eighteenth Century to Early in the Twentieth Century (Mostly Old Master and Early English Pictures), 3 vols., London, 1918-1921: 3(1921):109; Michael Jaffé, "Rubens in Italy: Rediscovered Works," The Burlington Magazome 100 (December 1958): 416. Gustav-Friedrich Waagen (Galleries and Cabinets of Art in Great Britain: Being an Account of more than Forty Collections of Paintings, Drawings, Sculptures, Mss., &c.&c., [Forming a supplemental volume to the Treasures of Art in Great Britain, 3 vols. ], London, 1857: 152), considered the painting to be a copy after Rubens. According to Jaffé 1958, 415 note 11. Peter Paul Rubens, 1577-1640, Wallraf-Richartz-Museum, Cologne, 1977, no. 7. Greek Gods and Heroes in the Age of Rubens and Rembrandt, National Gallery and Alexandros Soutzos Museum, Athens; Dordrechts Museum, 2000-2001, no. 64, repro. Rubens, Palais des Beaux-Arts, Lille, 2004, no. 13, repro. Rubens: A Master in the Making, The National Gallery, London, 2005-2006, no. 65, repro. L'Europe de Rubens, Musée du Louvre-Lens, 2013, no. 121, repro. Waagen, Gustav Friedrich. Galleries and Cabinets of Art in Great Britain: Being an Account of more than Forty Collections of Paintings, Drawings, Sculptures, Mss., &c.&c., visited in 1854 and 1856, ..., forming a supplemental volume to the "Treasures of Art in Great Britain." London, 1857: 152. Denucé, Jean. The Antwerp Art-Galleries: Inventories of the Art-Collections in Antwerp in the 16th and 17th Centuries. Antwerp, 1932: 197. Jaffé, Michael. "Rubens in Italy: Rediscovered Works." The Burlington Magazine 100 (December 1958): 415-416, 418, repro. Held, Julius. Rubens. Selected Drawings. 2 vols. New York, 1959: 1:202, no. 21. Alpers, Svetlana. The Decorations of the Torre de la Parada. (Corpus Rubenianum Ludwig Burchard, Part 9). London and New York, 1971: 254. Jacoby, Brigitte. "Studien zur Ikonographie des Phaetonmythos." Ph.D. dissertation, Rheinischen Friedrich-Wilhelms-Universität zu Bonn, 1971: 165-171, 227, no. 171. Jaffé, Michael. Rubens and Italy. Oxford, 1977: 30, 36, 71, 80, repros. Müller Hofstede, Justus. Peter Paul Rubens 1577-1640. Exh. cat. Wallraf-Richartz-Museums. 2 vols. Cologne, 1977: 145-146, 335, no. 7, color repro. Held, Julius S. The Oil Sketches of Peter Paul Rubens. A Critical Catalogue. 2 vols. Princeton, 1980: 1:292, no. 210. Huemer, Frances. "Rubens and Galileo 1604: Nature, Art, and Poetry." Wallraf-Richartz-Jahrbuch 44 (1983): 186, 188, 192. Jaffé, Michael. Rubens: Catalogo Completo. Milan, 1989: 75, 156, 157, no. 50, repro. Bauman, Guy C., and Walter A. Liedtke. Flemish Paintings in America: A Survey of Early Netherlandish and Flemish Paintings in the Public Collections of North America. Antwerp, 1992: 175-177, color repro. Jaffé, Michael. "Samson Destroying the Temple of Dragon: A Rediscovered Rubens." Apollo 139 (December 1993): 382. Huemer, Frances. Rubens and the Roman Circle: Studies of the First Decade. New York and London, 1996: 63, 68-71, 133, 241, 246 note 4, color repro. Oppenheimer, Paul. Rubens: A Portrait, Beauty and the Angelic. London, 1999: 201. Peter Paul Rubens--Barocke Leidenschaften. Exh. cat. Herzog Anton Ulrich-Museum, Braunschweig, 2004: 205, repro. Wheelock, Arthur K., Jr. Flemish Paintings of the Seventeenth Century. The Collections of the National Gallery of Art Systematic Catalogue. Washington, D.C., 2005: 146-153, color repro. Healy, Fiona. "Loosing Control of the Senses: The Fifth Horse in Rubens's Fall of Phaeton." In Caroline Zöhl and Mara Hofmann, eds. Von Kunst und Temperament. Festschrift für Eberhard König. Turnhout, 2007: 105-118, fig. 1. The Editors. "Listings: Agenda." Apollo 117, no. 609 (May 2013): 20, color repro. "Art for the Nation: The Story of the Patrons' Permanent Fund." National Gallery of Art Bulletin, no. 53 (Fall 2015): 8-9, repro.